The fundamental premise of At Ease With the Media is that extensive practice should be incorporated into all media training workshops—full-day, half-day or one-on-one coaching. More practice builds confidence and enhances outcomes. It helps participants put media training theory into practical action. This can be achieved in a full-day media training workshop with up to eight participants, a half-day workshop with up to three participants, and one-on-one in two-and-a-half hours. One-on-one training can also be offered via teleconference or Skype. No other media training program can match the practice component of At Ease With the Media. 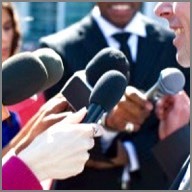 It is the best program available for preparing spokespeople effectively. Contact Eric to set up a program that’s right for you. “Early in my career I had the opportunity to participate in Eric's media training and I continue to use the principles he taught me. Since then, I have taken other ‘courses’ but I always default to what he taught me.